As preparations for Thanksgiving day are underway, any proper foodie would thoughtfully present you with some sort of lovely and healthy dish with which to nourish your body and please the palate of your holiday guests. Although I am forever grateful for nature’s beautiful bounty and the nourishment it provides, I must admit that during this time of giving thanks, my mind tends to wander from the table, shying away from the accepted act of overindulgence as an expression of joyful gratitude. In this season of giving thanks, my heart always heads for the hills where Mama Nature never fails to heighten my awareness of the abundance of beauty in my life. 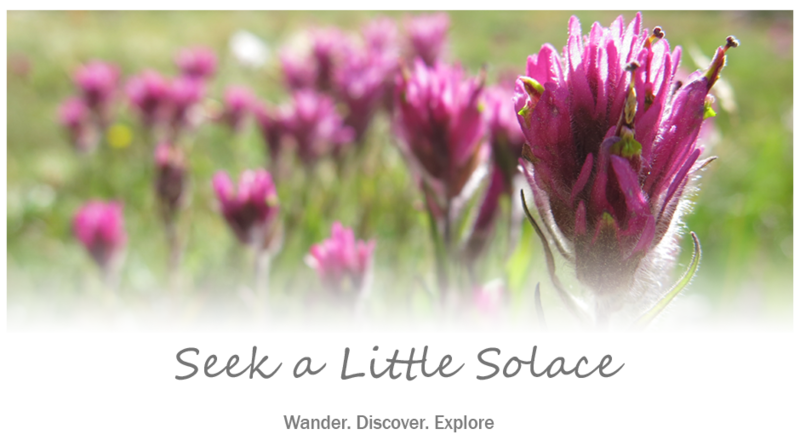 So, in keeping with tradition, my hubby and I sought some nature time this past weekend and found ourselves pondering our plenitude as we wandered with Winnedumah. Standing in the shadow of this mighty monolith, the spirit of the legend is palpable. 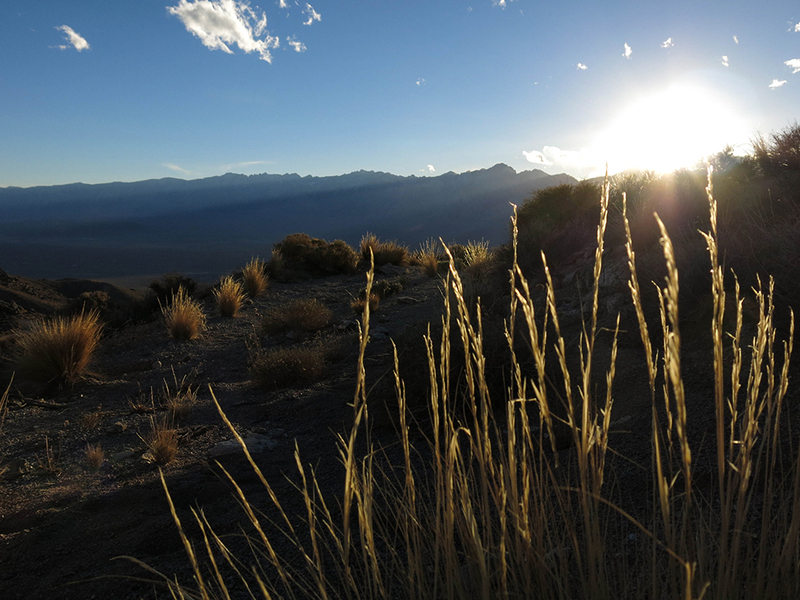 It is said that Winnedumah, a faithful Paiute brave in humble defeat, retreated to this spot atop the Inyo mountain crest where he prayed for the protection of his people. There he stands, a sentinel of stone, forever watching over his beloved people and the beautiful valley below. It was quite by happenstance that we ended up in this beautiful and sacred place. 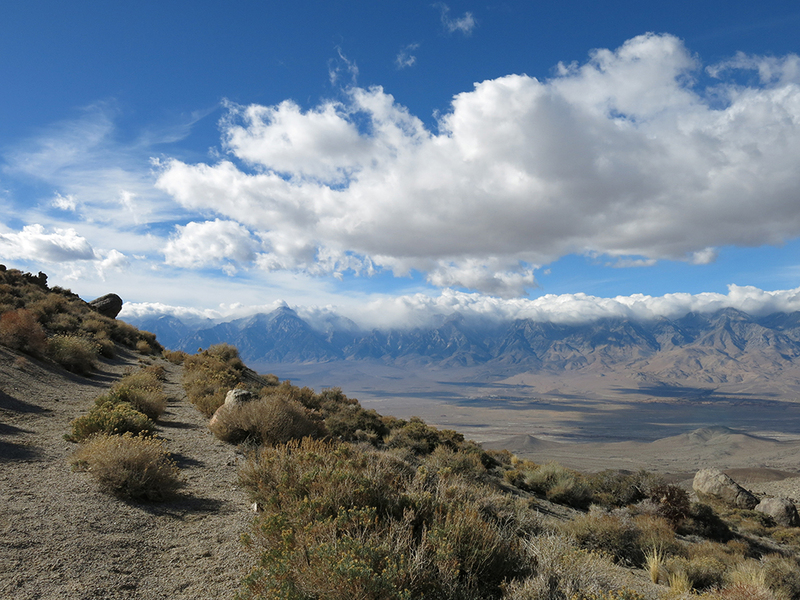 Hoping to sneak in one more late season Sierra hike, we had set our sights on Kearsarge pass out of Onion Valley. 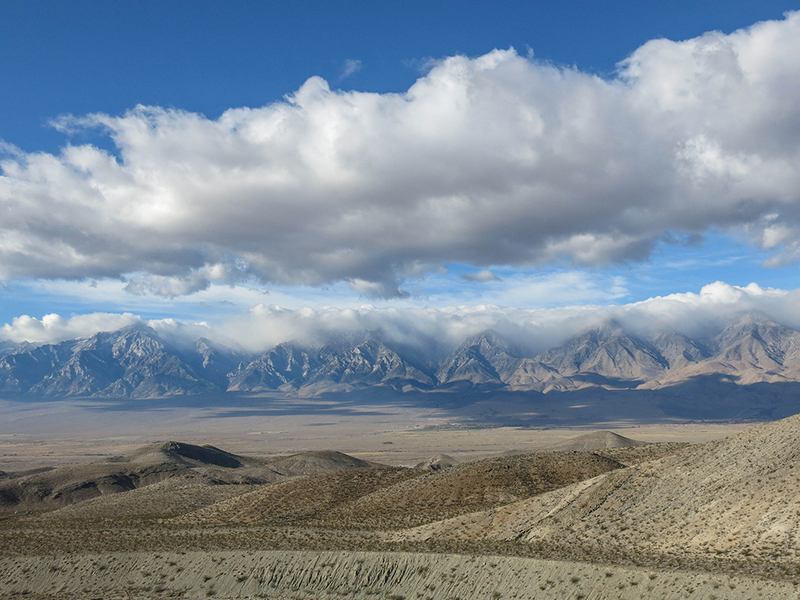 But, as we headed north on highway 395 toward Independence, we began to notice the clouds. 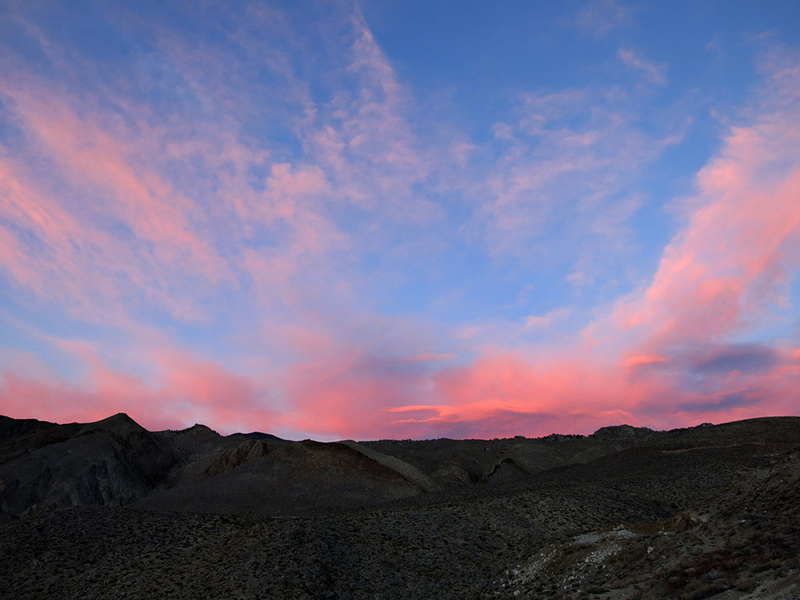 You know those clouds that seem to crawl over the mountain tops, endlessly dancing and enchanting. They cause you to pull over, make roadside detours and leave you oohing and awing for hours on end. And there we were…ooooh…awwww…snow!….oh… Did you check the weather? I didn’t check the weather, I thought you would check the weather. We better check the forecast. Indeed, the forecast predicted snow in the mountains. 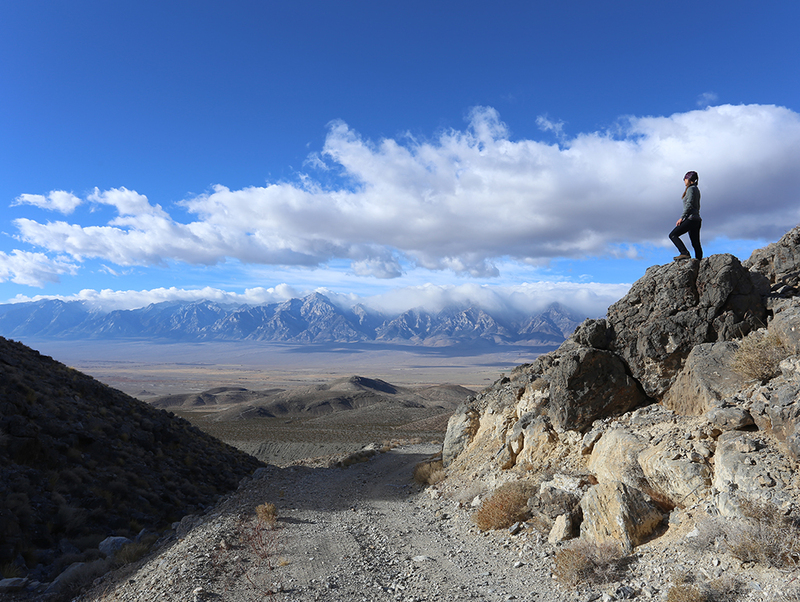 Well, this time we didn’t feel that climbing into the clouds would be a favorable experience, so we thought it might be best to enjoy the view from across the valley in the Inyo range. 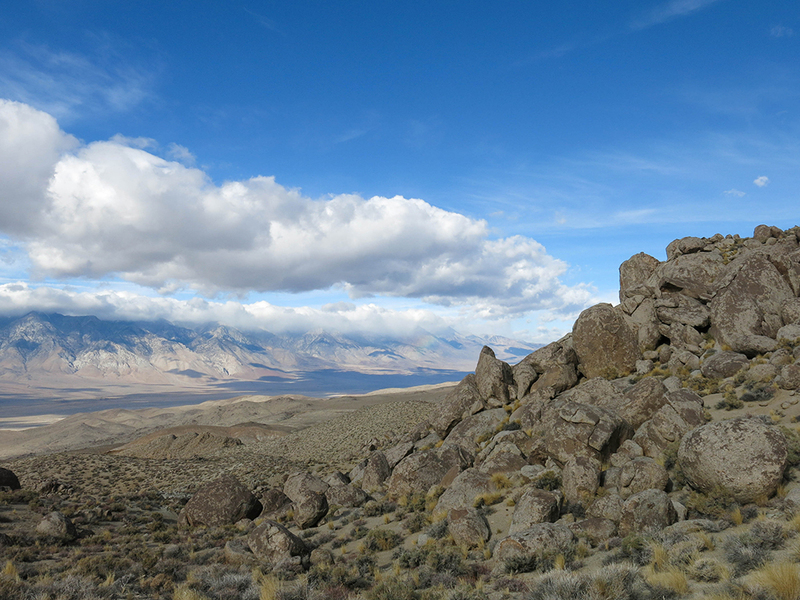 With only a vague idea of where to look, no guidebook, no preset coordinates or GPS, we decided to wander out in search of the Winnedumah Paiute Monument, an 80 foot granite monolith overlooking the Owen’s Valley from the crest of the Inyo mountains. 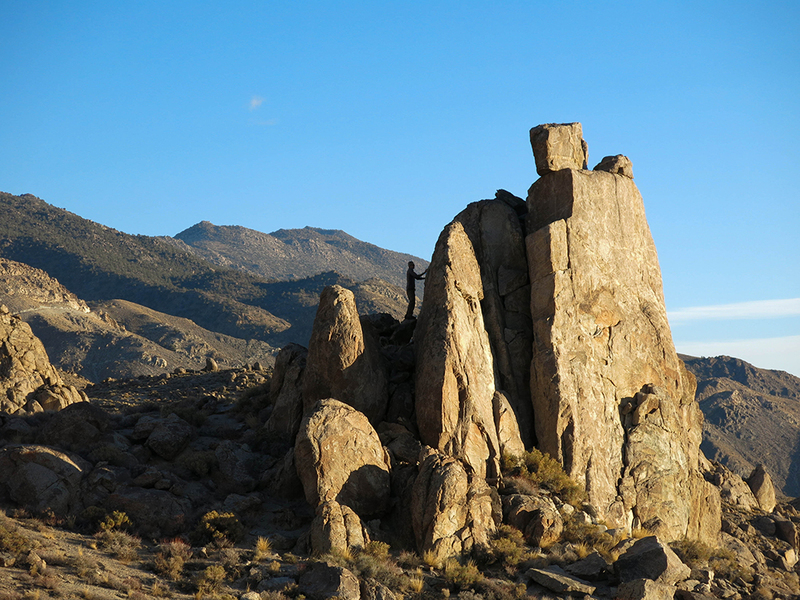 If you know where to look as you drive along highway 395, you can spot the granite monolith protruding from the crest line like a tiny little thumb. 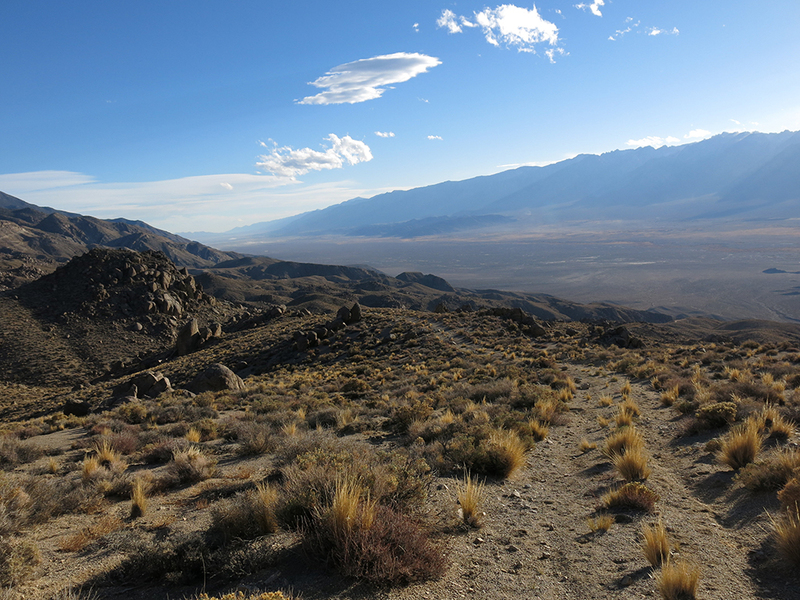 We knew enough to turn east off the highway just at the south end of Independence and park the car at the bottom of the dirt road leading into the hills toward the Betty Jumbo Mine. From there we ventured out in search of Winnedumah. 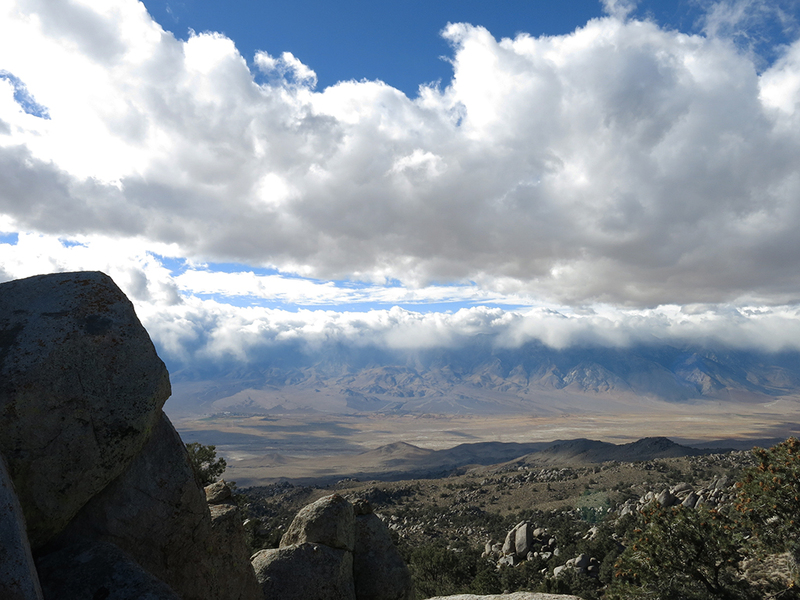 The view of the Sierra from here was incredible indeed and we spent the entire day captivated by the clouds. 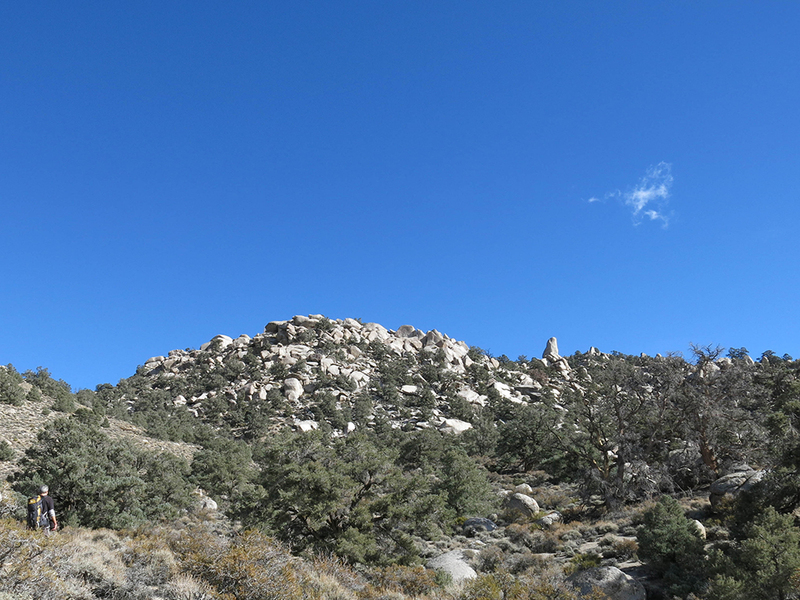 We hiked along the road for several miles before heading cross-country in what we thought was the general direction of the monument. 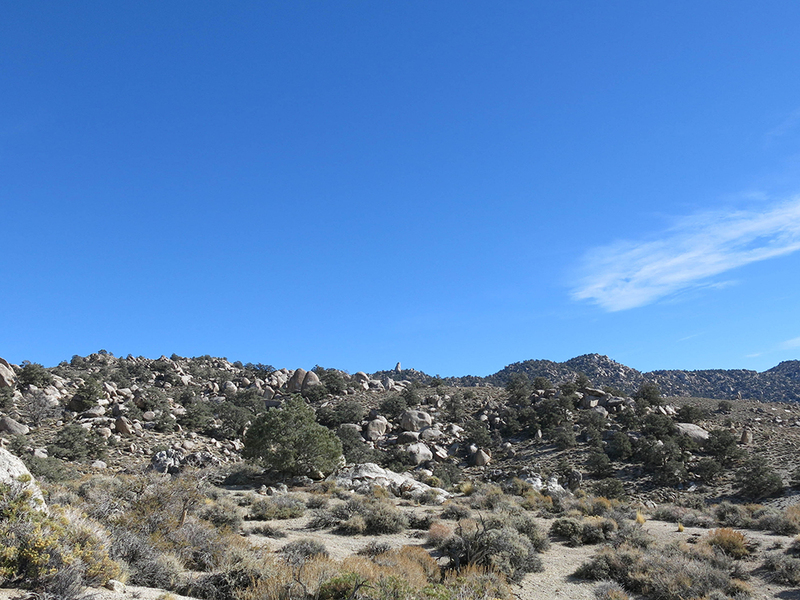 The desert terrain was a bit rugged and our navigation a little fuzzy, but eventually we made our way to a point where we could see the giant monolith in the distance. 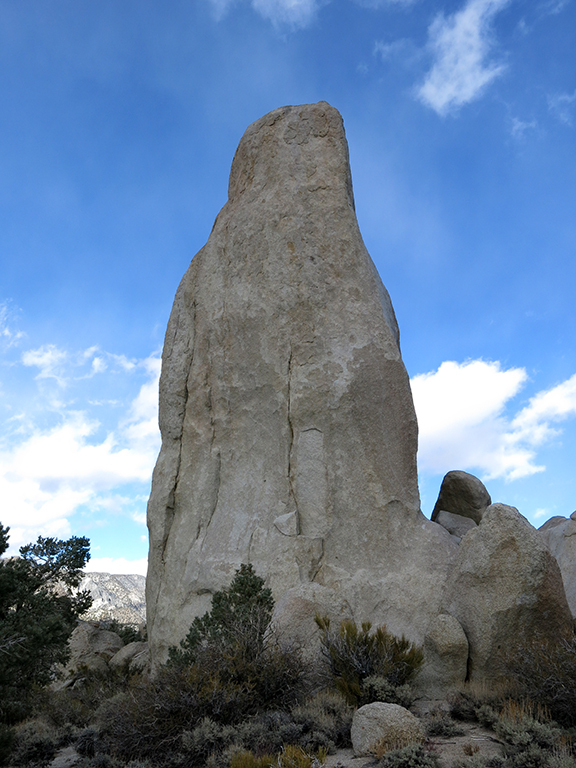 Unfortunately, the 80 foot granite giant appeared quite small to us, meaning there was still a fair amount of ground to cover. 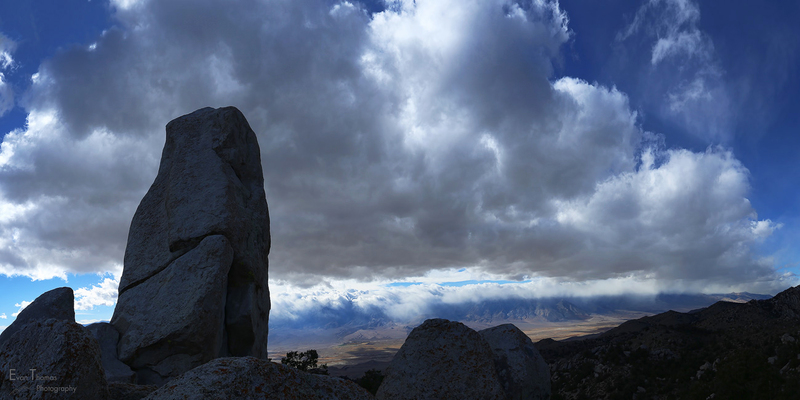 Finally, we found our way to the spot where he sits, this sentinel of stone, watching over the Owens Valley with an endless view of the cloud-filled sky. It was impossible to capture the breadth of the scene on camera. It was difficult to frame, the lighting was tricky and I quickly gave up trying to catch a decent glimpse. But thanks to Evan, his way with those landscapes and a wide-angle lens, we ended up with a pretty fine view or two to share. 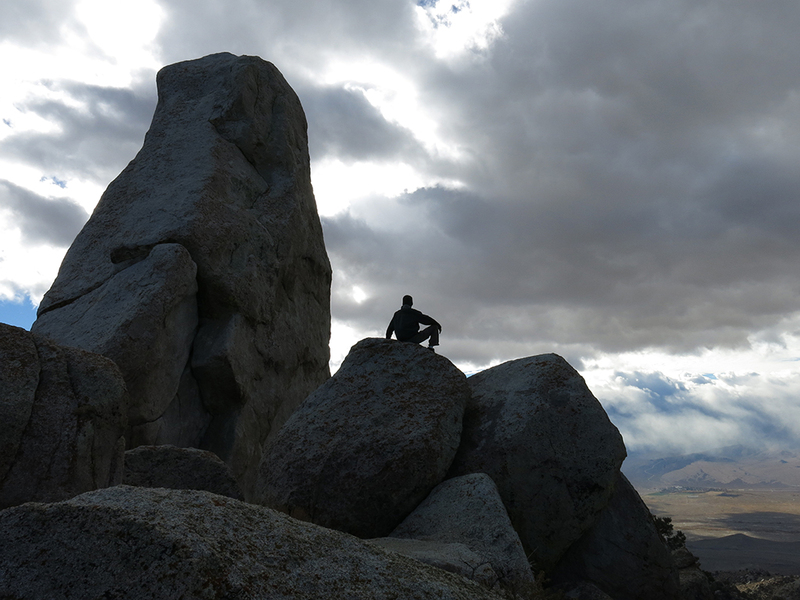 We did not stay too long as we needed to get back to the road before dark, but we paused to spend a moment with the sacred spirit of the place. 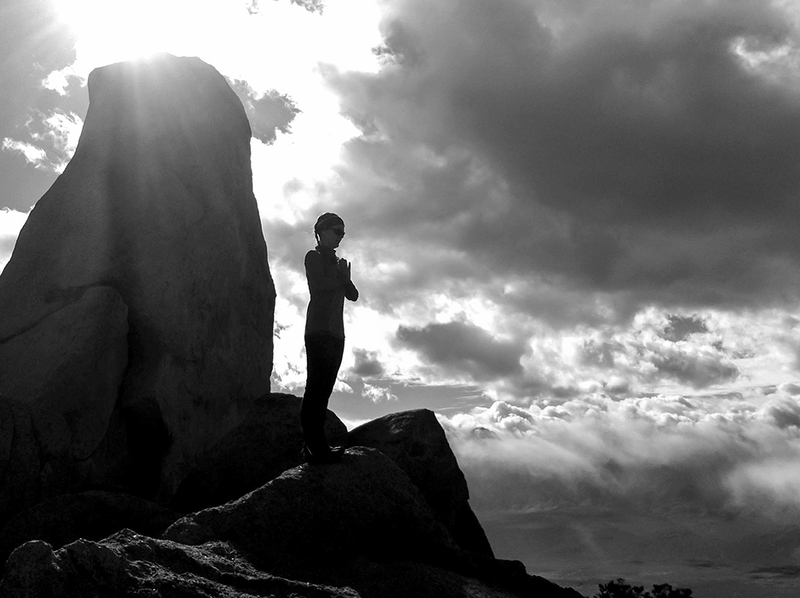 In quiet reverence we contemplated the legend and the life of those who came before. Lovers of the land, keepers of the animals, seers of a greater spirit, protectors of the tribe. It was a humble moment of gratitude. And with our humble hearts we headed back, picking our way through the rugged boulders and desert brush until we met the road. 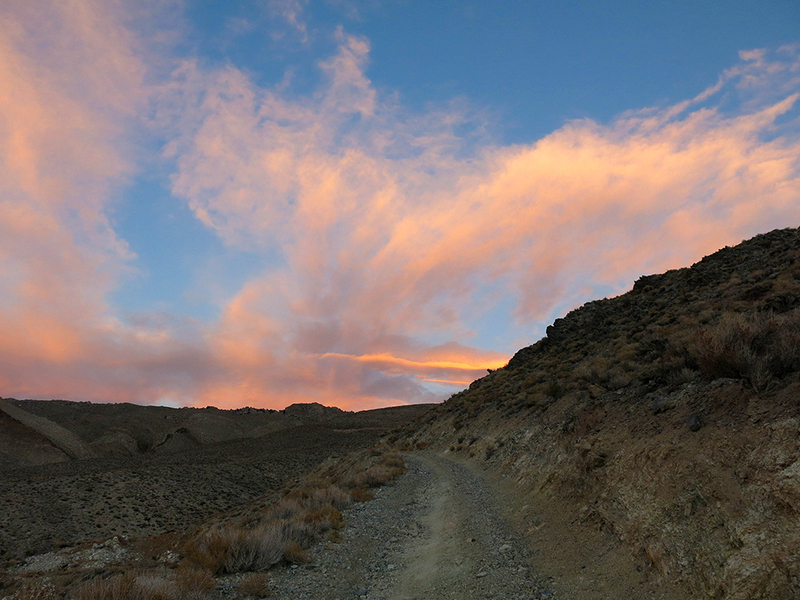 Once we were back on solid trail, we slowed the pace, savoring the warm glow of the late afternoon light. 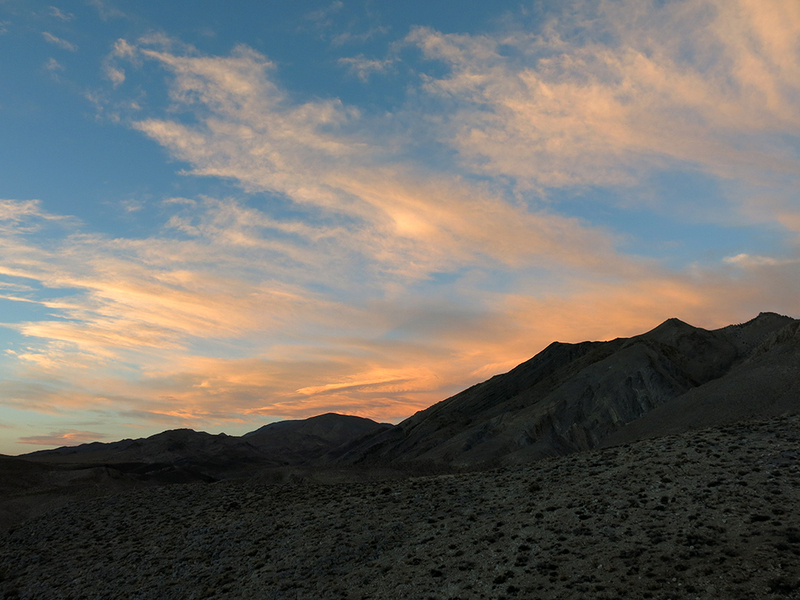 Oddly, the cover of clouds over the Sierra that kept us captivated all day long began to dissipate as the day drew to an end. It was not a spectacular sunset, but the quiet light at the end of a beautiful day always fills my heart with peace. And gratitude. I feel so fortunate to have serendipitously found myself in this sacred space, such a fitting place at this particular time of the season. To share a moment of gratitude with those who lived here long before you and I. To offer thanks to those who loved and lived off the land, cared for their people, honored the spirit of the sky and the sacred soul of the animal. May we all learn to live in such harmony with the earth. Beautiful photos! I first spotted Winnedumah in 1979, and have been fascinated with it ever since. Every time I travel 395 I look forward to seeing it/him. Now I know what he looks like up close. Thank you!